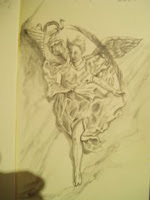 Caroline..Artist Afloat: What I had drawn in my new moleskine the night my father died. What I had drawn in my new moleskine the night my father died. The day I bought my moleskine, Idrew a sketch of an angel, an image that had just popped into my head.Later that night I heard my father had died. Today I told my brother, we had a lovely morning together talking, I am glad I had waited to see him to tell him rather than calling him. He was fine, had expected it too I think,so was prepared. We decided he should not fly to Scotland with me for the funeral as it would be too much for him ,( he is not too well himself) Isuggested he could go to his church and have a quiet time on the day, and he agreed he would be happier to do that. Tomorrow I intend to just have a very quiet day, maybe go for a bit of a walk locallyif the weather is good.Back to work on Monday.